Olentangy Liberty’s Ludwig Conrad (7) works against a Westerville Central defender during the first half of Monday’s key OCC clash in Westerville. 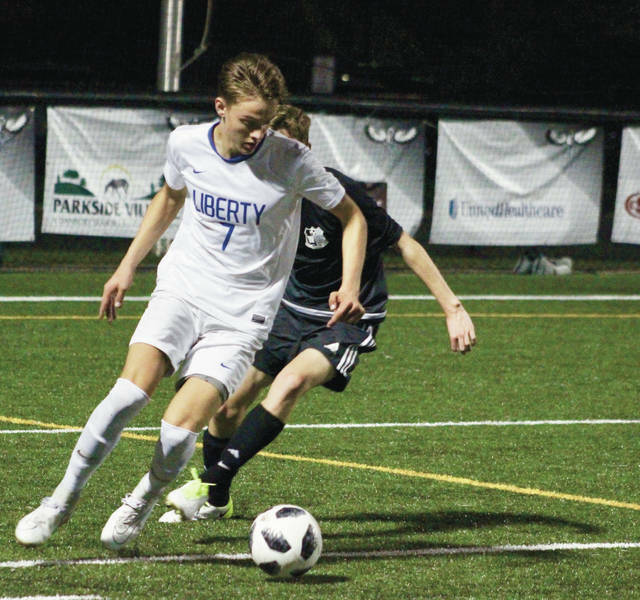 Liam Garcia scored a goal and assisted on another to lead the Olentangy Liberty boys soccer team to a 2-0 win at Westerville Central Monday night in Westerville. The win helped the Patriots capture at least a share of their second straight OCC-Buckeye championship. Garcia took an Ash Rajmohon pass to the right corner and centered it to Jagger Brooker, who touched it in to give the Patriots (11-1, 4-0) a 1-0 lead with 18:25 left in the opening half. Garcia was coming off the bench and not getting a lot of playing time early in the year. But, he kept working, D’Auteuil said, and tonight’s effort was the result. Then, Booker followed a Ludwig Conrad header, which was initially saved by Warhawk goalkeeper Jacob Borcilla, with a tap in to push the lead to 2-0 at the 4:01 mark of the first half. Theran Handlon had three saves in goal for Liberty. Borcilla stopped nine shots for the Warhawks (7-3-3, 2-1-1). Next up, Liberty is off until Saturday when it travels to Mason in non-league play. Kickoff is set for 7 p.m.
Jared Gibson scored twice, a goal in each half, and Ike Hedges scored one of his own to lead the Eagles in Monday’s non-league loss to Fisher Catholic. Olentangy Orange clinched a league title in style Monday, sweeping away visiting Westerville North to win the OCC-Buckeye crown. The Pioneers cruised on all five courts, getting wins from Caroline Sproule (6-0, 6-0 at first singles), Tyler Reed (6-0, 6-0 at second singles), Madison Bastian (6-0, 6-0 at third singles), Erin Storrer and Livie Mauger (6-0, 6-0 at first doubles) and Niki Bhimireddy and Abby Butler (6-2, 6-0 at second doubles). Renae Haferman and Evelyn Mignanou teamed up to notch a win at first doubles during Monday’s non-league showdown against visiting Marion Harding. The win was the only one the Pacers came away with, but it was an impressive one: 6-1, 6-1. Also: Mount Vernon 3, Big Walnut 2. Dani Worrel and Anna Pione scored in regulation and Worrel added another tally 45 seconds into overtime to lift Olentangy Liberty over Olentangy Orange Monday night. Taylor Disabito and Averie Ogden scored for the Pioneers, who had a 2-0 lead at halftime. Also: Upper Arlington 4, Olentangy Berlin 0.